Does my insurance cover varicose vein treatment? Yes. Most insurance companies cover treatments for varicose veins that are medically necessary, and in cases when conservative therapy with “compression” stockings has failed. This procedure is intended for treating insufficiencies in the vein system (saphenous or “accessory” veins) which is the primarily cause of unsightly and symptomatic varicose and spider veins. Instead of removing the diseased vein, (e.g.- surgical vein stripping) EVLT leaves the vein intact while permanently sealing it off from within. This is accomplished by using heat delivered from a laser fiber inserted into the incompetent vein. The entire treatment only requires a small, single needle-access site, (much like an IV) leaving minimal to no scars. Ultrasound is used to guide the fiber into place and only a local anesthetic is needed to eliminate any pain in the treatment location. Once the vein is closed, the blood that was circulating through this vein is simply rerouted to other healthy veins and the varicose vein essentially vanishes. In order to speed up healing time, we will advise you to walk around and refrain from sitting or standing for long periods of time in the weeks after the procedure. Patients are usually able to go about their normal daily activities shortly after having this procedure. Possible side effects or complications include minimal discomfort, bruising, inflammation, and/or temporary numbness. The development of more serious complications, such as infection, bleeding, nerve damage and/or blood clots, are extremely rare with this procedure. This procedure is not covered by insurance. You will be given a price quote at the time of your financial consultation. The VenaSeal™ closure system is the only procedure that uses a patented medical adhesive delivered endovenously (directly into the vein) to achieve closure of the vein. Guided by ultrasound, the physician inserts a catheter into the diseased area of the vein. Once in place, the physician administers the VenaSeal™ adhesive through the catheter at various points in a segmental fashion – using only manual compression to press the vein closed along the way. Once the treatment is complete, blood trying to travel through this vein is then re-routed through other healthy veins in the leg. Possible side effects or complications include minimal discomfort, bruising and/or mild inflammation. The development of more serious complications, such as infection, bleeding and/or blood clots, is extremely rare with this procedure. VenaSeal™ is administered without the use of tumescent anesthesia, making it an excellent option for patients who are hesitant or squeamish about needles. In the VenaSeal™ U.S. Clinical Trial, patients reported little to no pain or bruising post procedure. One-year results of the study continue to demonstrate safety and efficacy of the procedure, with closure rates of 97.2 percent. Patients enjoy both medical & cosmetic improvements; having reported virtually no downtime and little to no discomfort, meaning they can return to their normal activities immediately after the treatment. Ambulatory phlebectomy is a minimally invasive, outpatient procedure developed by dermatologic surgeons that removes superficial veins through small, slit-like incisions in the skin. Prior to the procedure, local anesthesia is used to numb the treatment area before the physician makes a very small incision. The bulging vein is then extracted through the incision, resulting in immediate improvement in appearance. In order to speed up healing time, we will advise you to walk around and refrain from sitting or standing for long periods of time for a few weeks after the procedure. Patients are usually able to go about their normal daily activities shortly after having this procedure. Possible side effects or complications include temporary discomfort, bruising, inflammation, skin numbness and allergic reactionto local anesthesia. All of these potential side effects are treatable. 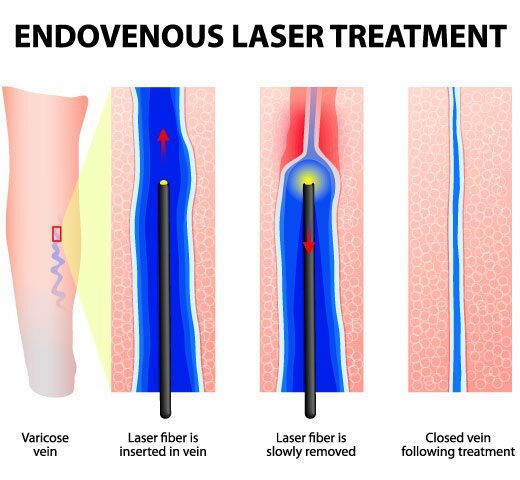 Ultrasound-guided sclerotherapy is used for the treatment of deeper diseased accessory vein branches that cannot be seen or felt. Using ultrasound, a solution is injected into the veins causing the vein walls to collapse. Therefore, USGS requires expert knowledge that conventional sclerotherapy does not. As the larger veins are treated, smaller spider and reticular veins will often disappear as a result. Possible side effects or complications include brown discoloration of the vein that may take up one year to disappear and usually requires repeated treatments. In very rare cases, skin ulcers may form in the treatment area. Also rare, but a possibility with any medication, allergic reactions can occur. All of these potential side effects are treatable. Varithena® is minimally invasive, nonsurgical and takes less than an hour to complete. The doctor administers a small amount of Varithena® through a catheter or by direct injection into the malfunctioning vessels.